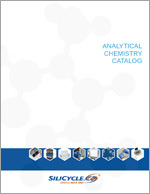 Ask for our Analytical Chemistry Catalog! 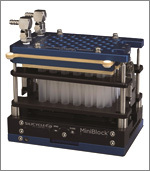 MiniBlock is a family of multifunctional parallel synthesis platforms widely used by chemists in the pharmaceutical, academic, biopharma, chemical, petrochemical and polymer industries. The flexibility of the design allows chemists to rapidly configure these compact parallel reactors to fit the needs of their chemistry, whether it requires inert conditions, refluxing or cooling, allowing complete freedom to choose a synthetic route. Furthermore, these easy-to-use reaction blocks are specially designed for parallel synthesis and screening reactions. They enable you to achieve multiple reactions simultaneously, using similar amounts of time, energy and starting materials, as it would usually require for a single experiment. 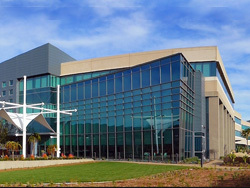 At SiliCycle, we are at the forefront of the chromatography industry, owing to the extraordinary purity of our silica gels and polymeric sorbents, combined with our capacity to rapidly adapt our products to meet the specific requirements of scientists worldwide. 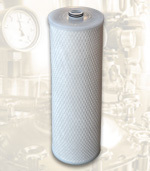 We offer a wide variety of first-rate UltraPure products. Our automated manufacturing process, which includes acid washing and multiple analyses, is continuously optimized to ensure high purity and a low percentage of fine particles, thereby guaranteeing optimal performance. With our multi-ton manufacturing capacity, we are your partner of choice for all your analysis, metal removal, catalysis, synthesis, and purification requirements. The ACS West Coast Analytical Chemistry Symposium is a discussion group formed by San Diego analytical chemists in partnership with the San Diego Section of the American Chemical Society (ACS) to provide a scientific forum for open discussion of current and future trends in analytical chemistry and opportunities to present current research, and to interact with like-minded scientists within the San Diego Community.